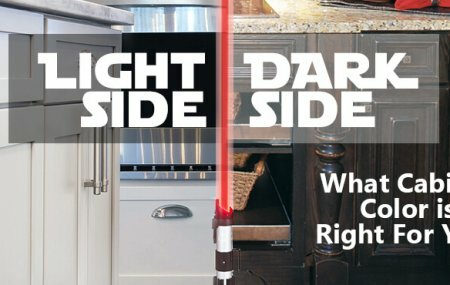 Light Side vs Dark Side: What Cabinet Color is Right for You? Most people have heard the phrase that the kitchen is the heart of the home. Regardless of how inviting the rest of your home may be, people tend to gather where they can enjoy the comforts of the kitchen. The color of your cabinets will affect the way your kitchen looks and feels, so making the decision between light or dark cabinets plays a significant role in creating the atmosphere you want in your kitchen. Before making that decision, here are some pros and cons of each finish. It’s a pretty safe bet that white or lighter colored cabinets won’t be going out of style any time soon. They have been popular for decades and are still the recommended choice for those who are planning to sell their home. White cabinets are versatile and go well with almost any paint color, countertop and backsplash. Lighter cabinets allow you to easily achieve the look you want, whether you want to go modern, contemporary, traditional, or country in your kitchen design. If your kitchen starts to feel dull after a couple of years, a simple change in wall color and kitchen decor can go a long way without having to invest in new cabinetry. If your kitchen space is on the smaller side, light colored cabinets work much better because they make the space feel bigger. They bring a fresh, bright look to your kitchen and enhance both artificial and natural light. White cabinets evoke a clean and sanitary look, while creating a light and airy feel to your kitchen. White or light colored cabinets show dirt and grime more quickly than dark cabinets and require constant cleanup. This is something to consider, especially if you have a large family or small children. They may also show signs of wear and tear, showing cracks and discoloration and other signs of aging more quickly than their dark counterpart. If you are looking for a cozy and elegant kitchen, dark cabinets may be the way to go. They provide a rich and formal feel to your kitchen, creating an atmosphere of luxury. Whereas white cabinets are pretty versatile in any situation, darker cabinets work best when you know how to make them compliment the space they are in. For this reason, darker kitchens require more design skill. If your kitchen is small or poorly lit, adding dark cabinets may make the room feel heavy and closed in. Likewise, dark kitchens need light colored elements to offset the dark cabinets. Lighter colored countertops or floors are good ways to create contrast and to help ensure your kitchen doesn’t become cave-like. Dark cabinets may be trendy now, but they don’t have the proven longevity that lighter colored cabinets have. Color stains and paints are always changing to compliment current times and trends, meaning the color you have now could become dated rather quickly. This is something to consider if you plan to sell your home in the near future. Unlike white cabinets, dark cabinets hide dirt and grime pretty well, making them a great choice for kitchens with heavy use or small kids running around. If you can’t decide between light or dark cabinets, a mix of both is fine too. The key is how you use the elements to your advantage. Consider using light colors for your wall cabinets and dark cabinets for your base; the reverse is not recommended as the dark cabinets could make the room feel too top heavy and unbalanced. Alternatively, try using dark cabinets for your walls and bases and light cabinets for your island, or vice versa. Kitchen designs are complicated and can be overwhelming when doing on your own. Our design professionals understand that every kitchen and family is unique and would love to help you create a kitchen that you’ll love for years to come. ‘Tis the season for holiday cleaning and remodeling. Many of us play host to all sorts of family and friends during the holiday season, so it’s no surprise that getting our homes in tiptop shape becomes a priority this time of the year. One of the most popular rooms to remodel before the guests begin to arrive is the bathroom. No one wants their guests to see an out-dated, or dilapidated bathroom. 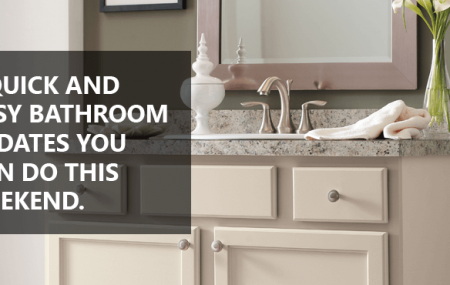 If you are thinking about a bathroom remodel for your home, here are a few ideas that can be done in a short amount of time, and leave your bathroom ready to impress. When you are ready to start your remodel project, be sure to visit the Williams Outlet, where you can find great prices on all the products mentioned in the post below. Let us help you save some money this holiday season. Updating your bath cabinet hardware and accessories are easy enhancers that will make a big difference to the look of your bathroom. Add a few matching accessories such as towel bars, hooks, and toilet paper holder. Switch out your knobs, pulls and other hardware to create a unified look throughout the bathroom. The small details say big things about your bathroom style. Your mirror or medicine cabinet is often a focal point of your bathroom so a mirror makeover will go far in your remodel project. If you have a flat, plate-glass type of mirror try adding a stylish framed mirror instead. From boring to beautiful with one easy change. If you want some extra storage in your bathroom, a nice wall cabinet over your toilet is a great option. Another popular choice for storage is a medicine cabinet. Just like with the mirror, opt for a more stylish medicine cabinet. They don’t have to be the plain jane slab mirrors like the medicine cabinets of old. Replacing an old, outdated vanity can transform your bathroom into an entirely different space. A new vanity can greatly enhance the storage, functionality and look of any bathroom. If you are replacing your entire vanity, check to see if there is a coordinating vanity top and or matching mirror. If you’re happy with your current vanity, consider replacing the top to add a new texture, style and color to your bathroom. Don’t forget to add a coordinating sink or select a vanity top with a built-in bowl. You can completely change the look of your bathroom just by installing new faucets and shower head. These improvements are affordable, easy to do, and will give the room a fresh new look. Opt for fixtures that are designed for improved efficiency and you can also reduce water usage and your monthly water bill. Most people think of toilets as purely functional, but today’s models offer a level of performance, efficiency and style that was not available a decade ago. Choosing an economical, high-efficiency or ultra-low-flow toilet offers substantial water savings without sacrificing performance or aesthetics.